Below is a pic of my shed. 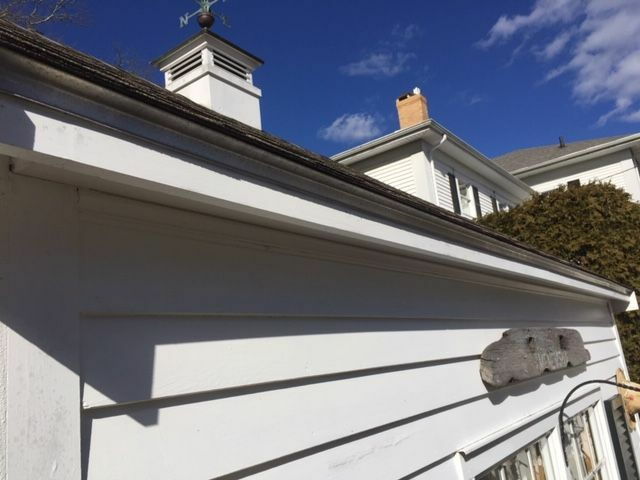 I've been wanting to install gutters but the fascia below the drip edge is only about 2 1/2." I thought about marrying a 2 or 2 1/2" strip to the bottom but question its strength. Are there smaller than standard gutters? I've considered splitting 6" diameter PVC but it'll probably yellow over time and not look very good. It's a 12' run. Last edited by Cobia 217; 03-17-2019 at 04:55 PM. Truthfully with a roof that big you don't need no stink'n gutters. I used a length of j-channel on one of my sheds to direct the water off to the side. Last edited by Mine Now; 03-17-2019 at 04:54 PM. I might have some 1/2 round copper gutter material, I bought pretty inexpensively. The foot print of the brackets is pretty small. Send me a pm, If you care to discuss. Gutter is fastened at the top of the gutter & it will be structurally fine mounted in your current facia. It it was mine, I would leave them off, maybe a diverter at the entry door, But not much more unless you are getting erosion. Its just one more thing to clean, once more place for ice to build up and lift shingles etc. An under drain at the foundation would be much better money spent for the created maintenance. If you are DEAD set, most 4" sheet metal run gutters will work with your soffits. They attach at the top with 6"-8" spikes. As above. I just had gutters installed on my similar shed. I agree with a drip strip. Biggest issue I see is there isn't enough meat to allow for any pitch, and I don't want it holding water. I'm getting some erosion at the front (which is pictured) but might just lay a border of crushed stone, maybe a foot wide, along the front side and forget the gutter idea. I'll probably be bringing the boat home in a few weeks so this could end up on back burner. Stone base is sounding better. Gutters are very commonly installed level and the downspouts placed accordingly. Pitch is not your issue. Look at any house. If the gutters were installed with a pitch the roof would look crooked from the street. Hey there we are........now that looks better. It's a 12 ft. run so would only need about a 1/4" or so drop from one end to the other. If I did it, there'd be a single downspout on the right end. Every gutter I've had professionally installed has a slight pitch towards the downspout. You can see the difference in the reveal between the top and the drip edge, but not from the ground. I was hoping a smaller size than the standard 4" was available but if not, I'll either try the j-channel or do the stone base. Aubv, thanks for the offer. View Next Unread Cruise to Cuba, inside cabin? All times are GMT -7. The time now is 08:54 PM.